Cold Aston is a pretty little village high up on the Cotswolds. St Andrew's Church is the venue for the 'Mini-Mouse' Striking Competition on Saturday August 14th (see notice on p.13), after which there will be general ringing (but earlier than normal: see Diary, back page). The bells are booked for 3 hours in all, so there will be time to have a good look round the church itself, which is interesting and unusual. It is believed the church dates from about 904AD, when the Bishop of Worcester gave land to his local thegn. Fragments of Saxon work still exist, some of which have been incorporated into the west wall of the porch. 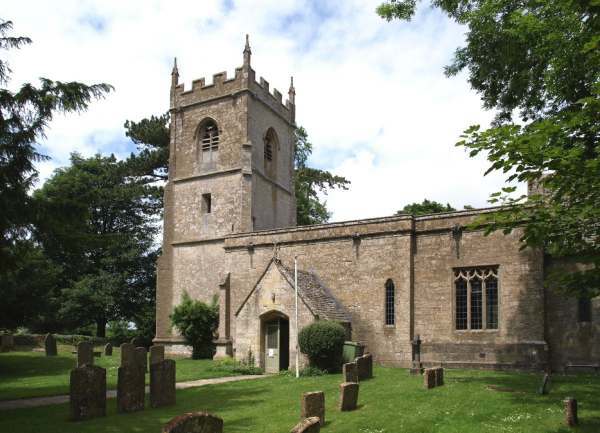 The church is fairly unusual in having no aisles, just a nave and chancel, but it is very unusual in having no East Window, a characteristic it shares with only 5 others in Gloucestershire. The Nave walls are chiefly Norman, and there is a decorated Norman South Door. A very fine, elaborate monument to a Lord of the Manor, Giles Carter, who died in 1664, is set into the north wall. The Chancel has a high-pitched roof that rises above the shallow-slope roof of the Nave. The Chancel East wall has the remains of a 14thC reredos, with the carvings above the niches displaying fine workmanship. The churchyard contains an ancient yew estimated to be at least 600 years old. Its girth measures over 16 feet (nearly 5m). The 15thC Perpendicular tower contains a stone vaulted ceiling above the ground floor. It was the reluctance of the diocesan authorities to have further holes drilled into this ceiling to allow the ropes through in a more convenient position for ringing that caused the ropes to drop initially rather too close to the walls. This was remedied later by having the affected ropes drawn through a rope guide. The bells are slightly unusual, too, in that the 4th is heavier than the tenor. They were unringable for very many years until a rehang in 2002. Details of the bells are:- treble, Abraham Rudhall I 1717, about 4cwt; 2, J Taylor 1880, 4-1-18; 3, Abraham Rudhall I 1717, about 5cwt; 4, Abraham Rudhall I 1717, 6-0-10; tenor, John Rudhall 1796, 5-3-16 in B. 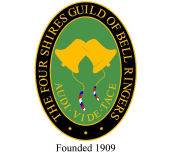 (The 'about' indicates these bells were apparently never weighed by the bellhanger.) There is another bell, and, unlike the others, is visible. However, it is unlikely to be used for an augmentation.